Hollywood legends Marlon Brando, Frank Sinatra, Jean Simmons and Vivian Blaine (from the original Broadway cast) are dazzling in this masterpiece, unleashing a spectacular, song-and-dance show that's loaded with entertainment. The slickest big-time New York City gamblers, Sky Masterson and Nathan Detroit, can't resist making or taking a bet on anything. So when a pretty missionary sets up shop in the neighbourhood, Nathan stakes a grand that Sky can't seduce her. But all bets are off when Sky falls madly in love in this romantic musical spectacular that sets the Big Apple afire with excitement! 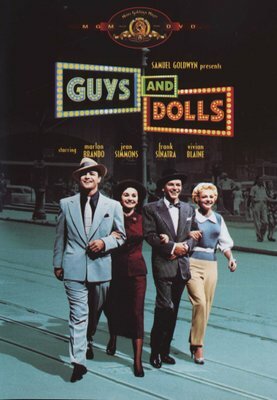 Featuring hits like "Luck Be A Lady" and "A Woman in Love," this smash film version of one of Broadway's most popular musicals is guaranteed, rip-roaring five-star entertainment.